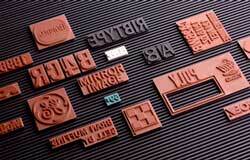 We have high-quality, interchangeable, ribbed rubber type stamps available for a wide variety of applications. 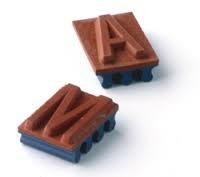 These stamps are precision molded to maintain extremely close thickness and alignment tolerances. Interlocking, ribbed rubber type easily locks into a similarly ribbed base. That ribbed base is then attached to your preferred stamping product – hand stamp, dater, metal self inking or roll coder. RIBtype® is readily available in a wide variety of stock sizes and fonts, including letters, numbers and common symbols. Mat: Multiples lines of text, logos or graphics custom cut to your specifications. Notches and cutouts are available to allow you to customize the type within the mat. RIBType is compatible with BASE-LOCK®, Grip-Line®,Sta-Tite® and other brands of ribbed rubber type, all proudly made in the USA.